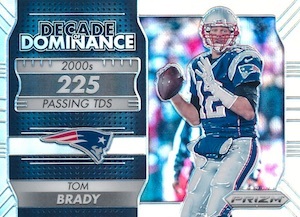 One of the more popular NFL sets from Panini each year, and an established brand across multiple sports, 2016 Panini Prizm Football showcases a similar look to previous editions along with a jumbo format. Each hobby box contains three autographs and at least ten numbered Prizm parallels. 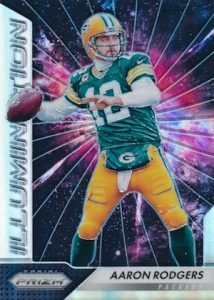 Taking a detailed look at the league, the 2016 Panini Prizm Football base set offers a rainbow of parallels, including multiple versions numbered to 299 or less. Among the choices are Light Blue, Orange, Camo (#/25), Gold Vinyl (#/5), and Black Infinite (1/1). 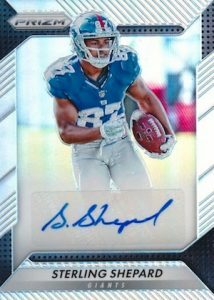 Largely maintaining the base design, signed cards in 2016 Panini Prizm Football are plentiful. Rookie Autographs focuses on the 2016 draft class while Patented Penmanship opts for the veteran stars. Prizm Pairs is a case hit that pairs two rookie players with autographs and relics. The signed parallel options are similar to the base set with Gold Vinyl (#/5), and Black Infinite (1/1). 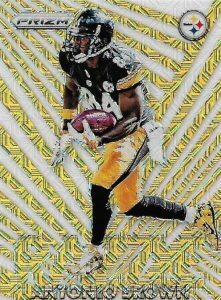 There are also several inserts to collect in 2016 Panini Prizm Football, including two sets that celebrate players who retired following the 2015 season. Only found in hobby formats, limited Peyton Manning Tribute and Charles Woodson Tribute inserts celebrate the elite players who started and ended their careers in the same years. Sticking with the incoming players, Rookie Introductions helps fill in the gaps for the new faces in the league. Falling less than one per case are the limited and "psychedelic" Razzle and Dazzle inserts. There is an earlier 2016 set from Panini that features a college take on the Prizm brand. 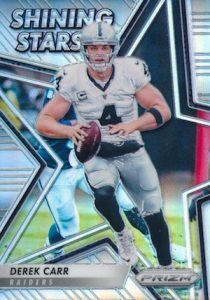 2016 Panini Prizm Collegiate Draft Picks Football includes many of the same players in their NCAA uniforms. 2016 SELECT PRIZM DAK PRESCOTT ROOKIE JERSEY AUTO RC 99! COWBOYS! 200 cards. Shop for complete base sets on eBay. PRIZM PARALLEL CARDS: Prizm, Blue, Flash, Green, Pink, Red, Red/White/Blue Disco, Orange #/299, Light Blue #/199, Blue Wave #/149, Purple Scope #/99, Red Crystals #/75, Green Power #/49, Camo #/25, Gold #/10, Gold Vinyl #/5, Black Finite 1/1. PARALLEL CARDS: Blue, Flash, Green, Pink, Red, Red/White/Blue Disco, Orange #/299, Light Blue #/199, Blue Wave #/149, Purple Scope #/99, Red Crystals #/75, Green Power #/49, Camo #/25, Gold #/10, Gold Vinyl #/5, Black Finite 1/1. RETAIL PARALLEL CARDS: Pink Prizm (Target Premium boxes) - around 100 copies, Green Prizm (Retail Packs) - 26 copies, Flash Prizm (Blasters) - 14 copies, Red/White/Blue Disco Prizm (Retail Multipacks) - 11 copies. PARALLEL CARDS: Blue Wave #/149, Purple Scope #/99, Red Crystals #/75, Green Power #/49, Camo #/25, Gold #/10, Gold Vinyl #/5, Black Finite 1/1. 24 cards. Serial Numbered #/24. PARALLEL CARDS: Gold Mojo #/10, Black Finite 1/1. PARALLEL CARDS: Green, Gold Mojo #/10, Black Finite 1/1. PARALLEL CARDS: Gold #/10 or #/5, Black Finite 1/1. All subjects not included in Gold parallel. View specific options with the full spreadsheet. 18 cards. Serial Numbered #/18. PARALLEL CARDS: Gold #/10, Black Finite 1/1. PARALLEL CARDS: Pink, Prime #/49, Super Prime 1/1. This looks good, but somebody needs to tell Panini that Justin Tucker is the most popular player in Baltimore. I know kickers aren’t popular with a lot of people, but Tucker and Vinatieri deserve their own cards. Come on. 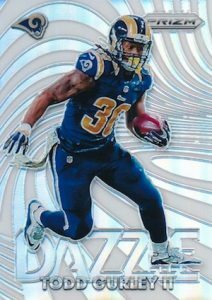 Aden Taylor � Prizm normally has a strong retail presence that is likely to include blasters and hangers as well as standard retail boxes, but I don’t know for sure. Retail is always fickle and could take weeks to pop up in some locations. Nice looking cards!!! In the checklist i see there is a Premier Jerseys set but I have yet to see any. Will they be retail only? ABSOLUTELY NOT!!!! Bought 2 hobby boxes of the 2016 Prizm Football at $120 each and was HORRIFIED at the quality of the cards.One box was ok and got a decent rookie sig card but the other box was rock bottom loaded with commons with sigs of no name players.One pack actually only had 6 cards!!! Then another pack had the bottom 4 cards creased right across the middle,RIGHT OUT OF THE PACK!!! For $120 a box I DONT THINK SO!!! Overall I like the product… very clean design with 10 #’d cards in a box? Sure $110-$120 may be a little much… but there’s a lot of value in these boxes. Saw a guy open a box and get 3 unnumbered autographs but also got an Emmitt Smith Gold Vinyl #’d to 5 and sold that for twice as much as what he bought the box for. I purchased my first box of the season and decided this would be it… I received 3 numbered autographs, 2 of which weren’t very good.. (Su’a Cravens Green Power #’d to 49 & Bronson Kaufusi Purple Scope #’d to 99) Already I was pleased with at least getting 2 numbered autographs and 10 numbered cards… but my last autograph was a redemption… card #21… an Ezekiel Elliot Green Power Autograph #’d to 49. Very pleased with the box and if you’re contemplating getting this box or a different one of equal or even a little more value, I still think this is the way to go. Bought the two blasters left at my Walmart today – was thinking there was a better way to burn 42.00 when I out of the blue got a Wendell Smallwood Swoosh 1/1 premier jersey in the last pack. Just wondering if this is the same as listed above (card 39) or is this a retail subset? The card is numbered PPJ-WS. Mike V � Panini has a habit of listing inserts on a checklist based on a numbering system but not actually numbering the cards that way. In many instances, they use initials instead of the number noted. 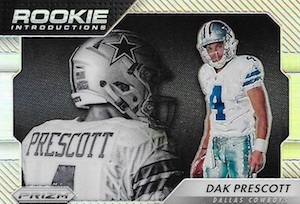 Got a blaster box from Target and got an Ezekiel Elliott Rookie Premiere Jersey card and Cody Kessler same, too. Got a Richard Sherman. 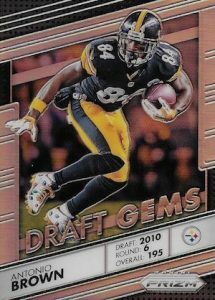 And Jamaal Charles Draft Gem cards, plus 5-6 parallel cards. Was this released as a retail product only? Have not seen it in the hobby shops??? It is not exclusive to retail. There are Jumbo hobby boxes with 12 packs. Does anyone have the print run of the retail colors? Spent $50 on a Target exclusive and got Panini Points instead of an auto. Really think that was BS and called them. Was told that it can be instead of an auto. Why does the box say i jersey card and 1 auto per box? Bunch of money grubbers. 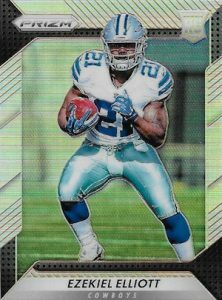 I pulled an Ezekiel Elliott Autograph on a red base card from a Target Blaster Pack. It is not numbered, and is a certified autograph by Panini. Can anyone offer any help with more info. The Red parallels are indeed rare but are not numbered. I never saw anything that listed the final print runs for these so this likely just an estimate by the seller. If you are interested in a specific card, you can always reach out to the seller to see how they came up with that figure.